Storm jibs are often seen as an insurance policy: something you know you should have but hope you never have to use. Like insurance policies, storm jibs tend to be ‘filed away’ before the small print is read. In this case the ‘file’ is probably at the bottom of the cockpit locker and reading the small print means rigging up the jib out at sea in a blow to see how it actually works. 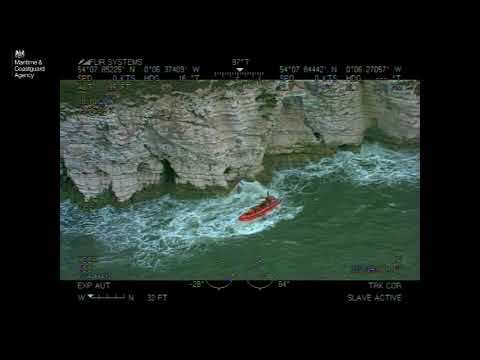 But how many of us do that and, just as critically, how many of us think seriously about what type of jib is the most practical to deploy and efficient to use? Plenty of coastal cruisers don’t have storm jibs, relying instead on rolling down the headsail. Some argue that in heavy weather you don’t want to go on deck anyway: it’s safer to stay in the cockpit. Others just turn on the engine and motor-sail with a reefed mainsail, while the lucky ones or those who calculate carefully enough never find themselves in a position in which they have to make upwind against anything nasty. Whatever the arguments, however, the chances are that one day you’re going to have occasion to use a storm jib – even if it’s simply because your roller genoa has been damaged, you’ve got a rope around the prop and it’s the only upwind canvas you can set forward of the mast. So, assuming that you decide to buy one, what are your options? The simplest and least expensive route on most boats is to have a jib that wraps around the furled genoa. These come in a variety of forms: jibs with built-in sleeves, separate sleeves that you attach to your existing hank-on jib, and two jibs sewn together at the luff to form a double-layer sail. 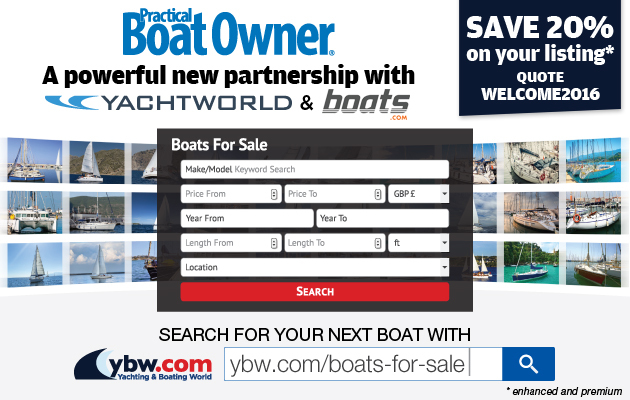 With any of these you need no extra equipment other than a second halyard. For our trials we headed out into 45 knots of wind with Jo Mooring Aldridge on her Contessa 26, Sulali. 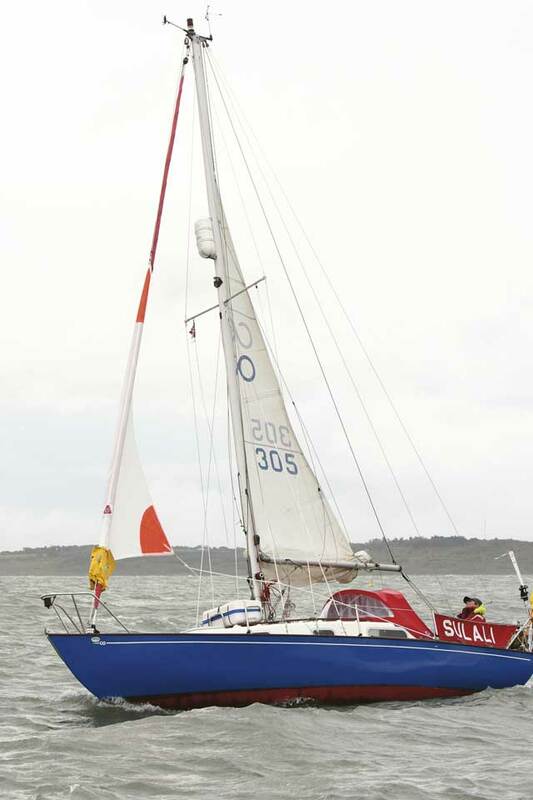 Jo loves sailing in heavy weather and often uses her storm jib, which she rigs on a removable inner forestay and hoists using the spinnaker halyard. We tested seven sails in eight configurations: three double-layer wrap-around jibs, one with a built-in sleeve, a sleeve that we attached to Jo’s own hank-on jib, two jibs hanked on to the inner forestay, and one that was set free-flying. Although the wind dropped during the course of the day, it remained brisk enough to present us with a challenge and allowed us to return with some firm convictions about which types of storm jib make the most sense. to both sheets. When hoisted, the sails wrap around the furled genoa to form a single, double-skinned storm sail. triple-stitched seams, but a sharp line of stitching running directly down the furled genoa would be a significant source of chafe when used for prolonged periods. The best point of this design, and unique to the sails tested, were the rope ties designed to hold the two leeches together. Although another thing to do on the foredeck, it only takes moments to tie a few reef knots, and we found it greatly aided sail control on the hoist as the sail was prevented from opening out. Ullman Sails’ SDS (Storm Deployment System) is similar to the Storm Bag, but a few crucial differences set the two apart. The first is cloth weight. 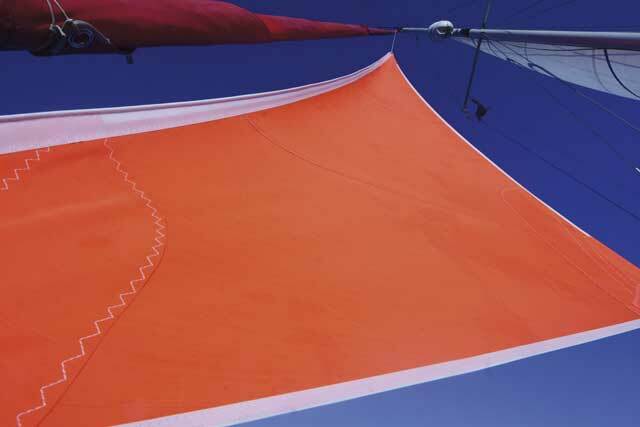 Ullman use a standard orange 10oz storm fabric for their sail, which is much stiffer than the white cloth used for the Storm Bag. The heavy cloth would be stronger for extended use, but we found it too stiff to hoist easily from the concertinaed folds in the bag. The second is the soft head, tack and clews, which combined with a soft toggle system of attaching the sheets removed any hard objects from the foredeck. 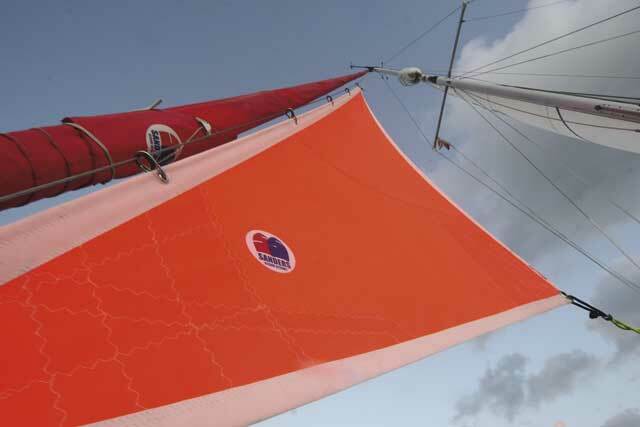 We liked this feature, and were very impressed with the build quality of the sail, which incorporates a mesh centre panel to minimise chafe, quadruple stitching and a Spectra luff reinforcement, continued beyond the foot to make a tack line. Finally, Ullman have used a mesh bag, which they suggest will drain faster. That may be the case, but it should certainly permit the sail to breathe more when stored. French sailmaker Delta Voiles have addressed the problem of handling cloth on the foredeck with a neat sailbag which wraps around the forestay, holding the sail in place until you are ready to hoist. 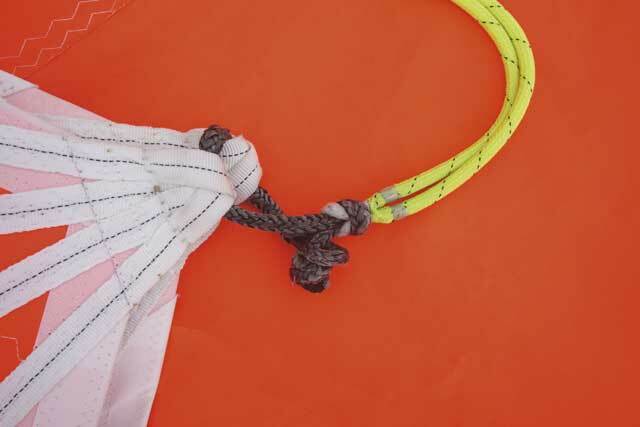 It was certainly easy to rig: simply wrap the bag around the stay, click the plastic buckles together to hold it in place, attach the snap-hook on the tackline, make fast the halyard and snap on the sheets provided. Less good were the instructions, which are pictorial with French and English text, and printed on the bag. Like most people in a stressed situation, we forgot to read them when rigging the sail, so guessed the system when hoisting. We tried the halyard first, but it’s essential to pull out the clews before hoisting. 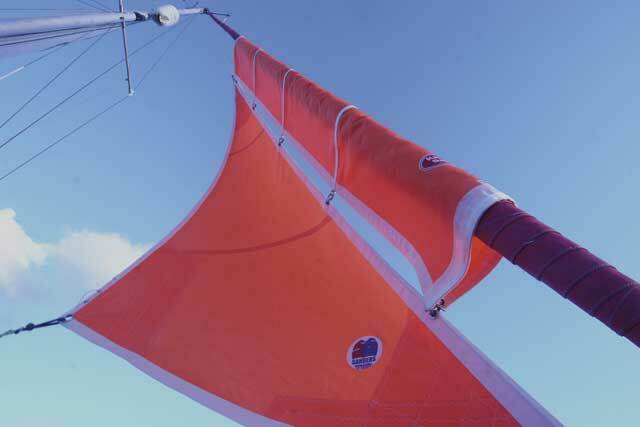 When used correctly the sail hoisted easily, although it billowed downwind in a bag until sheeted in firmly. 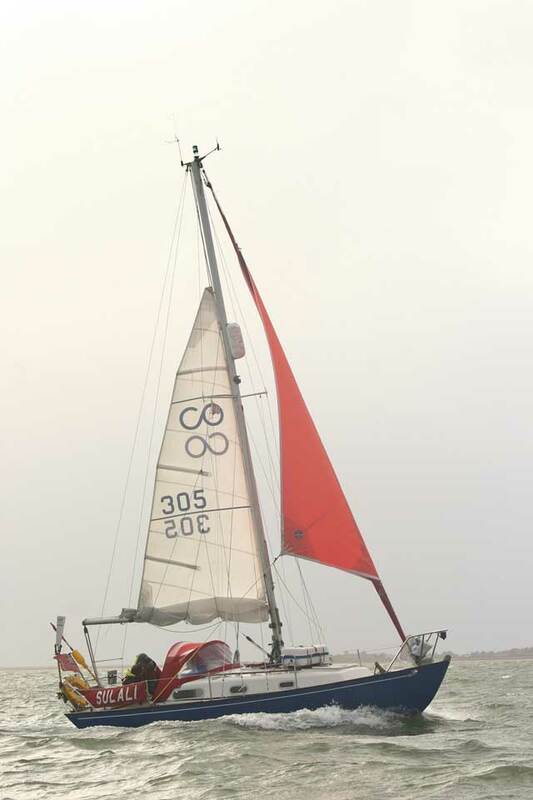 The sailcloth used is significantly lighter than the other sails, which helped it to leave the bag when hoisted and should be partly offset by the double-layered nature of the sail. 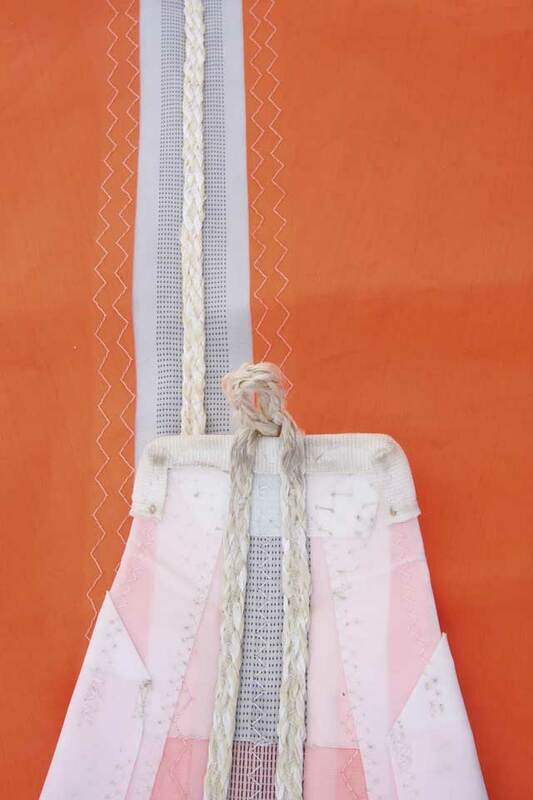 The sail is double-stitched, with external clew rings and a soft head. We were concerned by the snap shackle used to secure the sheets, which could cause damage if it hit someone. In common with the Ullman SDS, stowage requires accurate folding and would be very hard to achieve on the foredeck. Another type supported by cloth wrapped around the furled genoa, sleeved sails reduce the amount of cloth you need to handle on the foredeck compared with wrap-arounds. We tried two types: the Gale Sail, which has a sleeve integrated into the sail, and a separate sleeve from Kemp, which allows you to attach a standard hank-on storm jib. This is made from standard orange storm jib fabric, with external rings up each side to accept a storm jib’s hanks or hooks. Deploying it proved fiddly – for each hank you are also having to deal with two rings, so it can be a challenge to line everything up on a wet foredeck while also keeping the sail under control. We tried to prepare for this by fitting the sleeve to the sail beforehand, but if you do this remember you must wrap the sleeve around the genoa in the direction of the open hanks to avoid a tangle. Once fitted, hoisting was straightforward, but we found that the sleeve did little to support the sail in the conditions we experienced – it was effectively free-flying on the halyard tension. In stronger winds the sleeve would be more active, and it is of benefit when raising and lowering the sail as it keeps the luff under control. 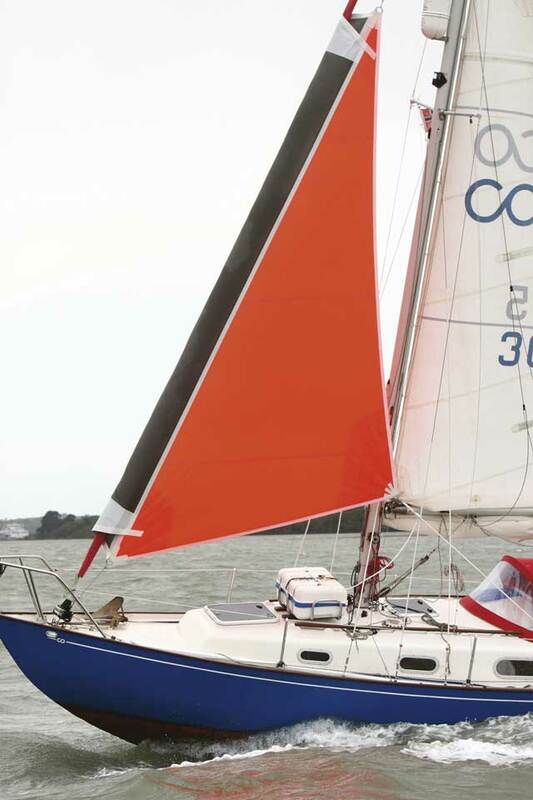 The 6m2 sail we tested was too large for Jo’s Contessa 26 (the other sails tested were 4m2 or less). 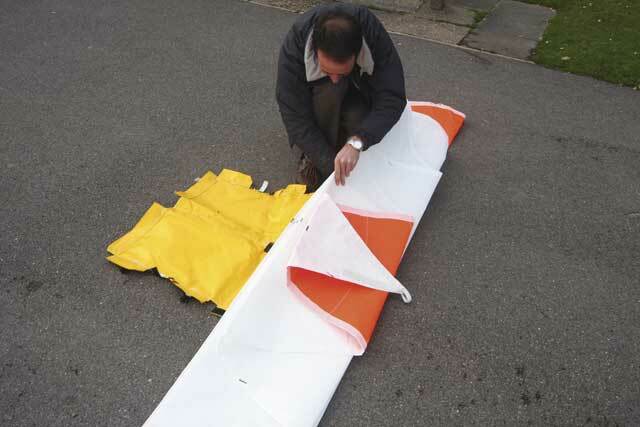 At present SeaTeach are not importing any smaller versions of this US-made sail, but this may change in future. Having the sleeve pre-attached means you need to make sure you wrap the sail correctly around the genoa, but had the benefit that there were fewer rings to confuse the issue on the foredeck. Gale Sail use a lightweight cloth for the sleeve, which wraps and slides easily. It was also narrower than the Kemp sleeve, so took the weight of the sail earlier. 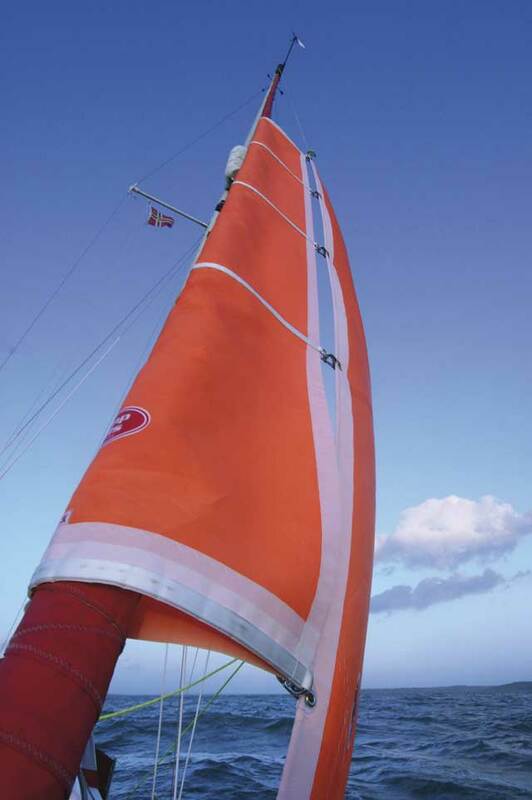 The sail is equipped with D-rings on all corners, and all seams are double-stitched. In the past, the principal methods for hoisting a storm jib were to hank it on to the forestay or an inner forestay, hoist a wire-luffed sail free flying, or use parrel beads up the furled headsail in much the same way as a gaff is held to the mast. We didn’t try the parrel beads option, but tried both the others as a comparison to the more modern solutions. Sailmakers universally frown on these, and with good reason. To be successful, you need to apply sufficient luff tension to completely remove the load on the standing forestay, which is virtually impossible on a larger boat. If you fail to achieve this, the sail will sag off to leeward and pointing ability is likely to be severely compromised. On our Contessa 26, however, this proved to be a viable solution as it was possible to apply enough luff tension to overcome the relatively low forestay tension. Other disadvantages still hold true, notably that the sail is prone to flogging uncontrollably while being hoisted and lowered. We tried Jo’s own Sanders storm jib (Sanders Sails, www.sanders-sails.co.uk), and a similar sail made by Crusader, hanked on to a Solent stay tensioned by a Highfield-type lever made by Seasure. Both sails were well made with little to choose between them, although Sanders had cut more hollow into the luff to help avoid excess fullness when the forestay inevitably sags in heavy weather. However, both proved the point that the hank-on system is still a good choice when compared with the alternatives. Once hanked on the sail will run up and down the stay with none of the friction-related glitches we found from fabric binding the furled genoa. On the negative side this system required two trips to the foredeck, once to rig the forestay and again to hank on the sail, but we found that it was preferable to handle small, well-contained tasks than have to handle a more complex system in one go. The main problems with these were that we had twice as much sail cloth to handle as with a conventional storm jib, so the sail was much more of a handful on the foredeck, and also that the sail needed to be fully hoisted and sheeted in before the two layers of cloth aligned. 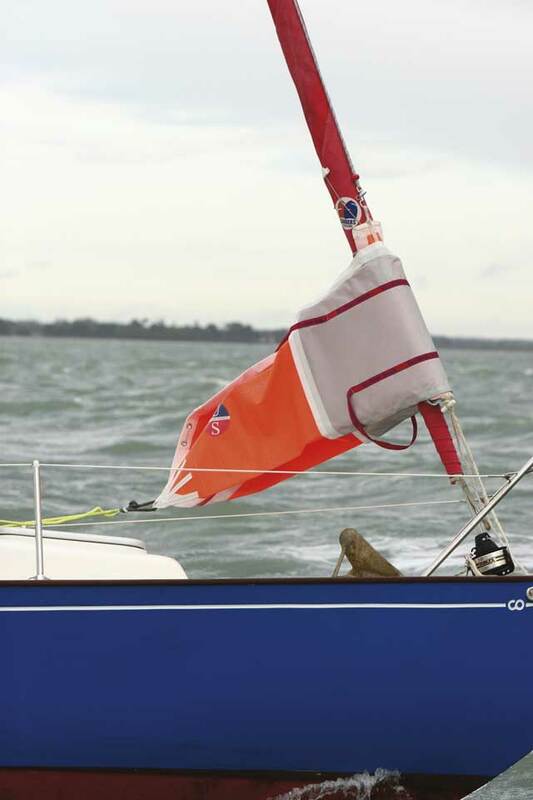 Until then it’s easy to present twice as much sail area to the wind – not what you want in storm conditions. When rigging them up you’re right at the bouncy end of the boat and getting seriously wet. We had removed the sheets from the furled genoa and attached a lashing to the clew before setting out; otherwise you need to take several rolls of the sheets around the sail (if you have enough furling line left on the drum to do so) and secure them to the deck or pulpit. Removing them altogether is preferable to reduce bulk but not easy out at sea, especially on larger boats if the clew of the furled sail is above head height. Rigging up wrap-around sails that don’t come packed in a launching bag takes time when you’re not making upwind, and that might be critical. When hoisted, they all set reasonably well. We didn’t fine-tune sheeting angles by adjusting the genoa cars but ideally you would. Most came with a tack strop that set them high enough above the deck not to fill with green water. A high clew also means they can sheet to the genoa tracks; otherwise you need a sheeting point further forward, which most boats don’t have. On the other hand you don’t want them too high: more heel, more luff-sag. Dedicated sheets are useful, preferably without snap shackles. We liked Ullman’s soft toggles at tack and clew (even if the tack strop was excessively long); there’s less chance of injury from a flogging sail. Crusader’s idea of tying the leeches together makes sense. When hoisting the other wrap-around jibs, we found that they blew off to leeward if the wind was on or forward of the beam, because they’re only attached at their three corners. If hoisted in accordance with the instructions they should go up without drama, but reading and following print and diagrams in the heat of the moment isn’t easy. Practicing is well worth while. If we hoisted while heading downwind, they tended to open out and set like miniature spinnakers. One problem common to all of them is that you have twice the weight and area of cloth to handle on the foredeck, when dropping if not when hoisting. They will also chafe the rolled-up genoa over the course of a few hours: the stitching and the overlaps in the stiff cloth will take their toll. In some ways the simplest ‘out of the bag’ jib to deploy was the Storm Bag. How well its lighter cloth would last only time will tell. With both the Gale Sail and Kemp’s separate sleeve the sleeves themselves did relatively little when the halyard was tensioned: most of the weight was taken by the luff. Kemp’s sleeve is a useful solution if you have a hank-on jib that you’ve kept from another boat, for example, and need to find a way to use over a rolled genoa. It was on the large and bulky side for the Contessa 26 and its principal purpose is to control the jib when it’s being hoisted and dropped. On the Contessa this set well enough when the halyard was cranked as tight as possible but by then the wind had eased. In a gale there would almost certainly be excessive luff-sag especially if you use a spinnaker halyard rather than a dedicated halyard for the storm jib. The danger of injury from a flogging sail means you can only hoist downwind, losing potentially valuable sea-room. This is what we would choose. On the Contessa the inner forestay joins the deck only just abaft the furling drum. On larger boats it’s usually further aft, though some provide no attachment point at all. 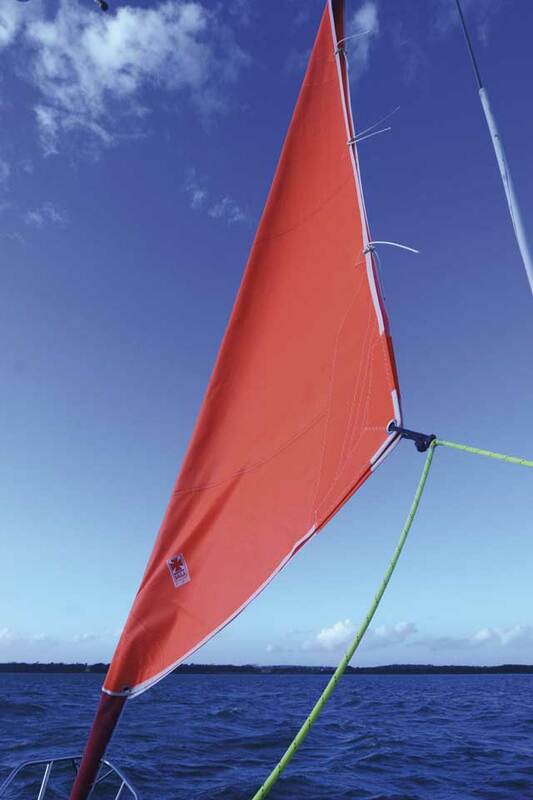 Hanking on a sail without the extra weight, bulk and complexity of sleeves or double layers is quicker and easier and you can hoist when heading into the wind. 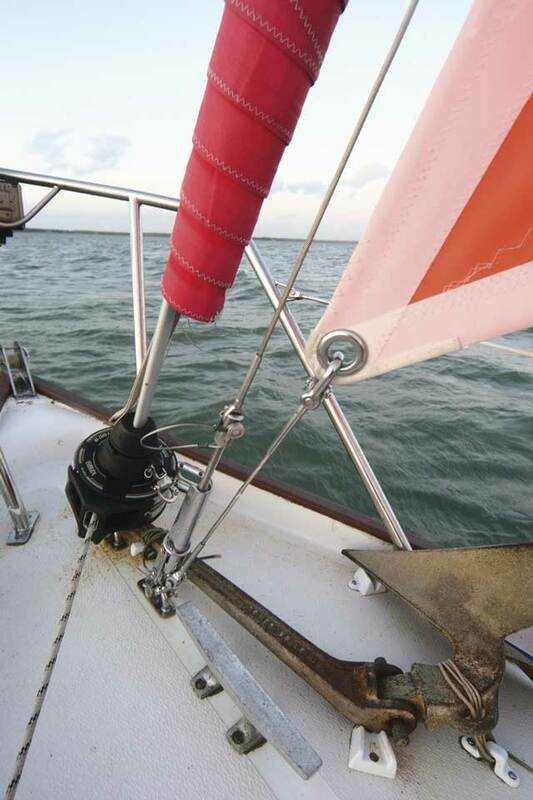 Various factors help to justify the additional cost of the inner forestay: it provides a way of setting a get-you-home sail if the roller genoa or furling drum are damaged, it’s a way of keeping the mast up if the forestay breaks, and you can use it to fly an extra headsail downwind or a working jib upwind. Some of the sleeved and wrap-around storm jibs are neat and compact but not one of them is a serious substitute for a storm jib on an inner forestay.